From rainbow hair to subtle rose gold tones, there's no one way to do Fantasy haircolor. Whether you're ready to dive into Fantasy haircolor with vivid haircolor trends like mermaid and neon or you'd rather experiment with softer shades of violet haircolor, get inspired with the looks below. With subtle, face-framing metallic highlights, this haircolor trend is a great way to experiment with fantasy haircolor with minimal commitment. This combination of soft, opalescent colors are equal parts romantic and edgy. Try rich blues or purples like you see here, or ask your colorist which fantasy haircolor would look best peeking through your brown hair. Going pastel pink hair is the ultimate way to shake up your haircolor. In addition to adding vibrancy to your overall look, this light pink haircolor uses a soft ombre technique to ensure easy upkeep (a dark root is incorporated from the beginning!). The best part? This pastel pink color is created using Shades EQ Gloss, Redken's secret to gorgeous, glossy haircolor that is easy to refresh. Ask your stylist to recreate this pastel pink look today! While vibrant, pastel haircolor is having a moment, this, glossy pastel peach haircolor is in a league of it's own. The subtle, icy shade starts with a darker root and fades to a beautiful, light peach haircolor at the ends. The best part? The color is created using Shades EQ Gloss, Redken's secret to gorgeous, glossy hair that is easy to refresh. Ask your colorist to recreate this pastel peach look today. Full Drama Magenta Ombre takes the pink ombre to the next level by transitioning from a dark natural root haircolor to dramatic pops of magenta and lilac haircolor. This gray & blue ombre haircolor begins with a dark root, fades into ashy gray haircolor and finally transitions into a blue ombre. Sunset Edge is the latest Redken fantasy haircolor trend. The look is inspired by all the shades of a New York City sunset. Redken Muse Amber Le Bon rocks the dramatic sunset haircolor with cool pinks, firey oranges and vivid violets. Ask your Redken Stylist to create the look using City Beats and Shades EQ and experience the fantasy haircolor for yourself. Sunny Neon Hair worn by Chloe Nørgaard featuring City Beats, Redken's vibrant semi-permanent haircolor, shades. Get one of the newest trends in fantasy hair, created by Redken Artist Sean Godard. Rose Gold Hair worn by Chloe Nørgaard featuring City Beats, Redken's vibrant semi-permanent haircolor, shades. Get one of the newest trends in fantasy hair, created by Redken Artist Sean Godard. 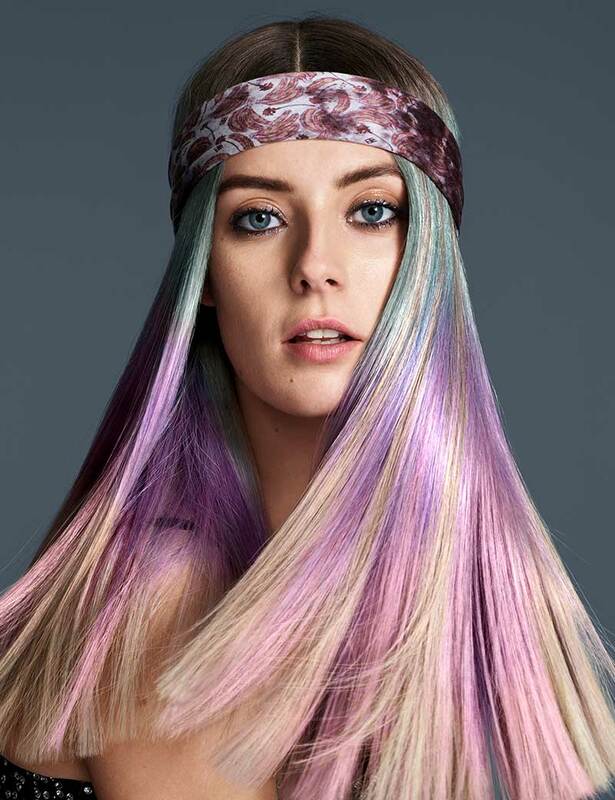 Inspired by the oil slick hair trend that we’ve all been seeing (and loving), Redken Artist Sean Godard decided to gloss up Redken Muse Chloe Norgaard’s strands and add a mix of vibrancy to her dark base. By using City Beats, he was able to take her hair to the next level and add hints of vibrant color throughout to create this perfect swirl inspired by oil.